After EXIT presented No Sleep Festival’s “zero” edition at Petrovaradin Fortress in 2017, which gathered over 20,000 techno lovers and featured acts like Jeff Mills, Ellen Allien, Paula Temple, Rebekah, Vladimir Ivkovic and Jane Fitz, this year’s edition will be a whole new festival taking place in Belgrade from 16 to 18 November! The new member is also the sixth in the festival family run by the EXIT Team, and has originated from the internationally praised No Sleep Novi Sad stage at the EXIT Festival itself. 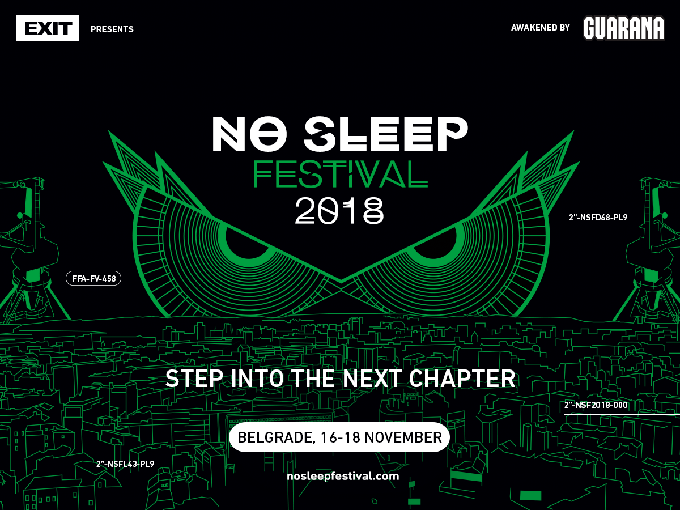 Over the past four years, No Sleep has evolved into a music platform that joins many events throughout the whole year in many global cities, including the Serbian capital where it will settle as a new festival in its own right. Spread across a full weekend, No Sleep Festival will feature a round o’clock non-stop program at multiple locations in Belgrade, including the central mammoth warehouse, known as the New Hangar in Port of Belgrade, next to Danube. It will also include lineups at city’s well-known clubs like Drugstore, 20/44 and various other spots, with some of the world’s most exciting electronic music acts, alongside local finest talents. After three historic performances in EXIT finales, as well as headlining almost every other leading festival in the world, Nina Kraviz is coming back to Belgrade, the city she remembers very well for some of her earliest steps towards the global scene, outside of her native Russia. Nina returns at the moment when the whole world is watching her every move with an unprecedented attention, while her new music keeps hitting the floors in the shape of genre-bending remixes. In the same time, her distinctive record label трип just had its 20th release, a ten-track LP compilation featuring the purest forms of acid, industrial techno and even gabber. Shuffling constantly sleepless between train stations and airports, the biggest stages and the smallest of record shops, playing among the heavyweights like the one she has become herself and pushing along her side some of the least known talents, Nina remains fundamentally independent. Without any managers to run her career and call the safe shots, she draws creative people from all sides, helping others to get the much-deserved spotlight she carries with her whilst making way for the next generation headliners. One such artist is the British-Berliner, Dax J, who conquered the world with closing sets on some of the greatest events. Many have dubbed him the best DJ of the new generation, and leading festivals have placed him among headliners. Young French rebel of mysterious identity and a striking alias, I Hate Models, is following in his footsteps. He rapidly caught the world’s attention thanks to his furious Depeche Mode remixes and a list of singles spearheading the new super-exciting wave on the world electronic scene. The No Sleep Festival will be held at several locations, while the central events with the state-of-the-art production will be held at the industrial surroundings in the Port of Belgrade, right on the shore of river Danube. After old Hangar hosted some of the world’s most prominent DJ acts, Belgrade reveals its new prime electronic music warehouse venue, bigger and much better in all production aspects. It is simply called the New Hangar and is becoming a new main spot for the largest electronic events in Belgrade, located just 1,500 m from the city’s main Republic Square. Apart from the main venue, No Sleep Festival will have numerous afterparties, daytime parties, exhibitions, workshops, as well as a musical conference with panel discussions touching some of the most current topics on the electronic scene. The No Sleep music platform, envisioned by EXIT, has been gathering some of the most exciting acts and clubbing brands in the world for the past four years. At its place of origin, the No Sleep Novi Sad stage at Exit Festival, some of the greatest clubs in the world gather each year, including: fabric, Concrete, Tresor, Sub Club, Fuse, Arma17, The Bunker New York, Nitsa, Salon des Amateurs and Grelle Forelle, as well as the local Serbian clubs, such as Drugstore, 20/44 and Tunnel. In the last three years, EXIT and No Sleep events have toured the world in cities like New York, London, Moscow, Barcelona, Rome and Vienna, and this November they are coming back to Belgrade, this time as a fully-fledged indoor music festival. The list of hundreds of performers gathered by the No Sleep platform so far, from those at EXIT, to those who played its beach edition at Sea Dance Festival, as well as the EXIT’s No Sleep launch events around the world, includes name such as Jeff Mills, Nina Kraviz, Dax J, Amelie Lens, Rødhåd, Helena Hauff, Moritz Von Oswald, Charlotte de Witte, DJ Tennis, Craig Richards, Ellen Allien, The Hacker, Vatican Shadow, Paula Temple, Rebekah, Function, Red Axes, Honey Dijon, Mike Servito, Denis Sulta, Rebolledo, Eagles & Butterflies, Dasha Rush, Kobosil, Antigone, Francois X, Zadig, Kangding Ray, Nikita Zabelin, Bjarki, Powell, Jane Fitz and many others. Among them, there are many local and regional performers, such as Tijana T, Vladimir Ivković, Dejan Milićević, Marko Milosavljević, Insolate, Kristijan Molnar, Lag, Miloš Pavlović, Filip Xavi, Scalameriya, TKNO, DJ Jock, Ilija Đoković, Aleksandar Grum, Sugar Lobby, After Affair, Noise Destruction, DJ Brka, Schwabe, Boža Podunavac, Vlada Janjić, Stevie Whisper, Akioki, Beyond House, Tapan, Svetlana Maraš, 33.10.3402, Techno Klinika, Mihajlo HFM, Monosaccharide and others.